If you are one of the many couples struggling to conceive, you are not alone. Our full-service fertility center offers many advanced techniques to help you achieve the dream of a successful pregnancy. Our caring staff and board-certified physicians recognize the emotional and physical needs of couples struggling with infertility and focus on helping them become families. 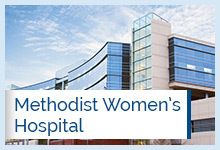 Visit the Reproductive Health page on our Methodist Women's Hospital site for more information.